Pine trees are a type of evergreen that grow naturally throughout most of the northern hemisphere, but now can be found even in tropical regions. 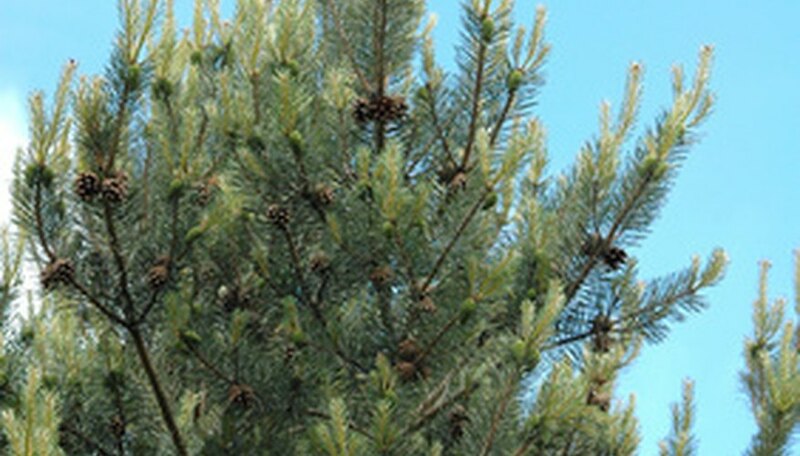 Pine trees generally do not require fertilizer, but it may be necessary if they are growing in poor soil. However, caution must be taken when fertilizing these trees. as too much fertilizer can actually cause damage to the tree. To ensure your pine tree stays healthy, use the proper fertilizing technique. Measure the diameter of the tree truck with a measuring tape. Use 1 cup of fertilizer for every inch of the trunk's diameter. For example, if the trunk is 3 inches thick, use 3 cups of fertilizer. Measure the distance from the tree trunk out to the tips of the bottom branches. Increase the distance by 50 percent to determine how far out the fertilizer needs to go. For example, if the distance from the trunk to the end of the branches is 10 feet, add 5 feet. This means the fertilizer must be spread out 15 feet from the tree trunk. Mark the distance with wooden stakes. Sprinkle the fertilizer (equal parts potassium, phosphorus and nitrogen) lightly about a foot away from the tree trunk. Work your way around the tree in a circle while gradually moving further away from the trunk. Continue doing this until you reach the designated distance. Make sure the fertilizer is spread evenly throughout the entire area. Water the entire fertilized area immediately. The water will help the soil absorb the nutrients from the fertilizer. Do not fertilize the tree before it is a year old and after it is five years old.